The school also offers a breakfast club facility. This opens at 8.00am to 8.45am. Children are offered a variety of cereals, milk, fresh orange or apple juice, toast/crumpets or muffins with various toppings (subject to availability). There are a number of activities for the children. There are always two members of staff on duty. The present cost is £3.00 per child per day, which must be paid either on the day or prior to attendance. Pre booking is not required, children merely present themselves at the Extended School Room. There are lots of activities taking place during these sessions including help with homework. The children are also provided with a drink and snack. The cost is £3.90 per hour and the club will run up to 2 hours from 3.05 pm – 5.05 pm. Registration forms can be collected at the school reception desk and must be completed before attending this club. * Any further siblings who attend at the same time will be at a discounted rate of £1.50. * Any further siblings who attend at the same time will be at a discounted rate of £1.95 per hour. Please note: Payments MUST be paid either on the day or prior to attendance. Can we please remind parents that children need to be picked up from school on time at 3.05pm. If you are late picking up children they will go to our After-school Club at a charge of £3.90 per hour. Whilst this may seem unacceptable to parents, safeguarding the children is our priority. 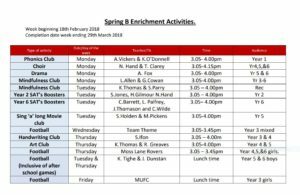 Enrichment Clubs 2019 will run Spring, Summer and Autumn again this year! Letters went out with a choice of clubs to choose from. Your child should now know if they have a place – please speak to your class teacher if you haven’t heard back. Times will run from 3.05pm – 4.00pm unless stated differently. As you can see from the photos, the children love coming to these clubs and have lots of fun. As a member of the choir your child will appear at Young Voices at the MEN Arena as well as the End of Year Performance – further details to follow. Can we please remind parents that Only Year 6 pupils, with their parents permission, are allowed to walk/ride to and from school on their own. All other children MUST be accompanied by an adult or an older sibling (Year 6 or above).